As promised a few posts back, here's the "fan movie" of the Meet the Robinson's Dragonfly Cinema Flipz™ book I did as a concept demo. Hopefully, my Flipz book will surface at Disney and I'll get a follow up word on it from them. In the meantime, enjoy. Sometimes the power of the internet truly amazes me. In response to viewing one of my Dragonfly Game Flipz movies on Youtube.com, I recieved this video comment called "A Pleasant Surprise". The film maker is from the Netherlands and I just get a kick out of connecting with people all over the world. It seems he shares an interest in flip books, also. I really like this short and hope you do, too. Please leave comments on his youtube page and mention I sent you there. It seems "300", the movie inspired by the Frank Miller's graphic novel had a great box office opening the weekend. I tried to see it last friday, but all the showing were sold out. I was very impressed with the first trailer when it came out several months back, so I did a Dragonfly Cinema Flipz Book of it. It's been posted on gametrailers.com and youtube.com and so far has recieved over 9,000 plus views. Just in case you missed it here it is again. Dragonfly 300 Cinema Flipz Book. Here's another artist link worth checking out. Lynnetta Miller posted a website up date on the Animation Nation board under her AN member name "Nettajean". I don't know Lynnetta personally, but I think she has some wonderful art on her site. I especially like the pencil drawing of the guitars. 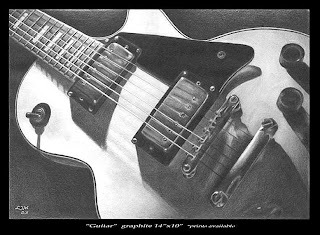 The drawing of the Gibson Les Paul guitar above is a an good example (the guitar pickups are the same type that's on my Gibson 175T). So, I've added her to my link list. Do yourself a favor and visit her site. 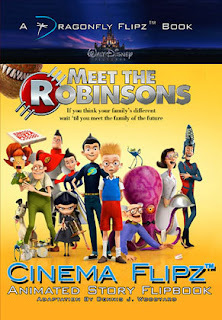 Disney's Meet the Robinson's animated feature opens later this month. It looks like a lot of fun, I really like the trailer. Back in December, I did this Dragonfly Flipz book from one the movie's trailers. The Flipz book came out really well. A sample of this Flipz book is floating around Disney's marketing department right now, or forgotten in someone's desk. I was told there was interest in doing something with it but there's been no contact since January (I can take a hint). So, I'll try to post a fan movie of it on youtube.com soon. It may be the only chance it has to be seen. My internet connection was out for a couple of days. Boy, talk about feeling cut off from the world. No emails, Ebay, blogging, quicktime game and movie trailers, flash animation or other online "time stealers". But, I also needed it for work (to download storyboard reference art) and business (I got a email from a company in Canada interested buying 1000 flip book, just as the internet connection went south. Great timing!) But all seems to be back to normal for now, but it does point out how important the "net" has become for me and others. I, for one, still like to think I keep it in perspective, but according to my family I spend too much time on the computer. But, during the online downtime, I did other things like help at my boys little league practice and continue playing my guitar (every night for at least half an hour) and do regular family stuff. There is a life beyond the net. So, after you read this, go take a walk around the block, it will do you good.